Transition Town Guildford is starting a new monthly speaker series – Bright Ideas. 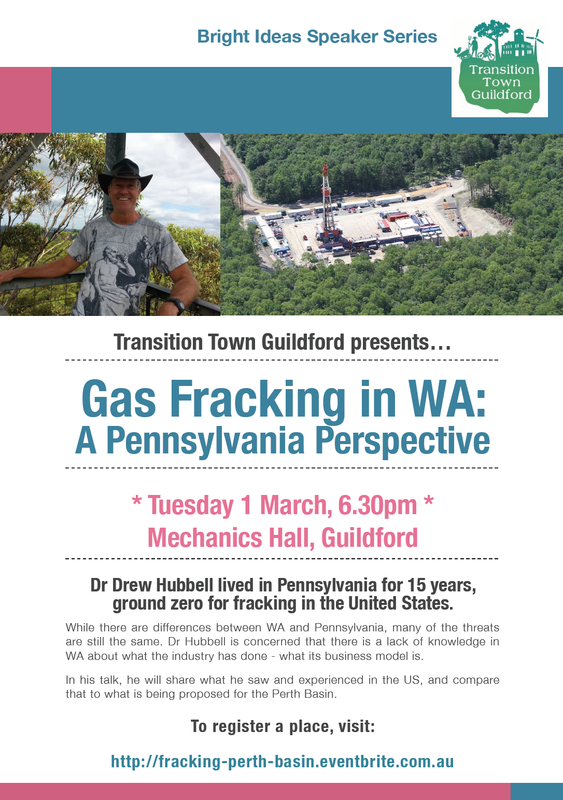 Our first event will be a presentation by a recent Perth resident, sharing his experience of Fracking in the USA. A timely talk given the potential of fracking encroaching on the Perth Basin and the Swan Valley. Dr Drew Hubbell lived in Pennsylvania for 15 years, ground zero for fracking in the United States. While there are differences between WA and Pennsylvania, many of the threats are still the same. Dr Hubbell is concerned that there is a lack of knowledge in WA about what the industry has done – what its business model is. In his talk, he will share what he saw and experienced in the US, and compare that to what is being proposed for the Perth Basin. Dr Hubbell is an academic with a Ph.D. in Literature. He has taught at the university level in the United States for 25 years. He is currently Associate Professor of English at Susquehanna University, Selinsgrove, PA, and Adjunct Professor of English at UWA. His scholarship is in environmental literature and the way literature contributes to human-nature relationships. In June, 2015, he moved to Perth with his wife. Drew got involved with CCWA and No Fracking WAy shortly after moving here, after learning that WA was seriously considering the promotion of unconventional gas (“Fracking”). This entry was posted in Climate Change, Energy and tagged Frack Free WA, Frack Swan Valley, Hydraulic Fracturing, No Fracking WAy, Perth Basin. Bookmark the permalink.